Tell them just what a big deal they really are. Cuz they must have done something really special to deserve these little nuggets of joy. This is honestly the best darn fudge we have ever tasted. It is lovingly made by candy makers in a small Texas town using the freshest premium ingredients. They'll love the twelve fabulous flavors including ‘Nut’orious (chocolate fudge, walnuts), Big League (chocolate fudge, caramel, peanuts), and The Great Divide (chocolate and peanut butter fudge). 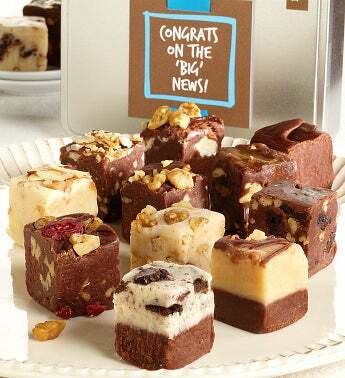 The silver gift tin has a funky & unique giant stretchy rubber band holding the "Congrats on the BIG News!" greeting card. Tell them just what a big deal they really are. Cuz they must have done something really special to deserve these little nuggets of joy. This is honestly the best darn fudge we have ever tasted. It is lovingly made by candy makers in a small Texas town using the freshest premium ingredients. They'll love the twelve fabulous flavors including ‘Nut’orious (chocolate fudge, walnuts), Big League (chocolate fudge, caramel, peanuts), and The Great Divide (chocolate and peanut butter fudge).